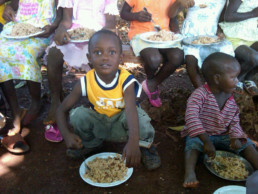 Well, after a year of planning, we were finally able to start a program of feeding hungry kids. We had to cut down the size of program we initially had planned because we would not have been able to continue to fund it at the pace we have been receiving funds. But small is probably better in the early going as we learn the ropes. Nothing wrong with taking our time and doing it right. We learn as we go. We are feeding one hundred kids in this particular village. 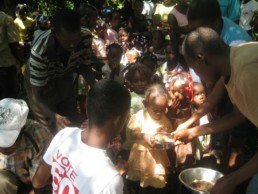 We hope to begin soon to feed children in a second village of about the same size. In doing development I suppose there is probably nothing particularly strategic or sustainable when it comes to feeding hungry people. I mean, these kids are going to wake up hungry again tomorrow, right? What I do know is that malnourished kids are sick kids and that it’s hard to learn when you’re sitting there hungry, and that while we set about the painstaking tasks of development it won’t hurt to love on people along the way. 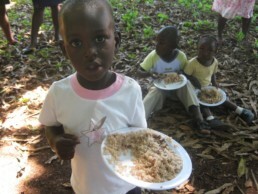 Besides, as we feed we will be bringing trees and garden seeds and farm animals to their homes. In the future, then, they won’t need people to come to feed them. They’ll do just fine on their own. Development and compassion need not be mutually exclusive activities. It’s not either/or… it’s both/and.